Whenever we need to look for hidden files, we just have to enable the Windows options for it. Although its not hard to do this, not all users knows or even aware about this option. 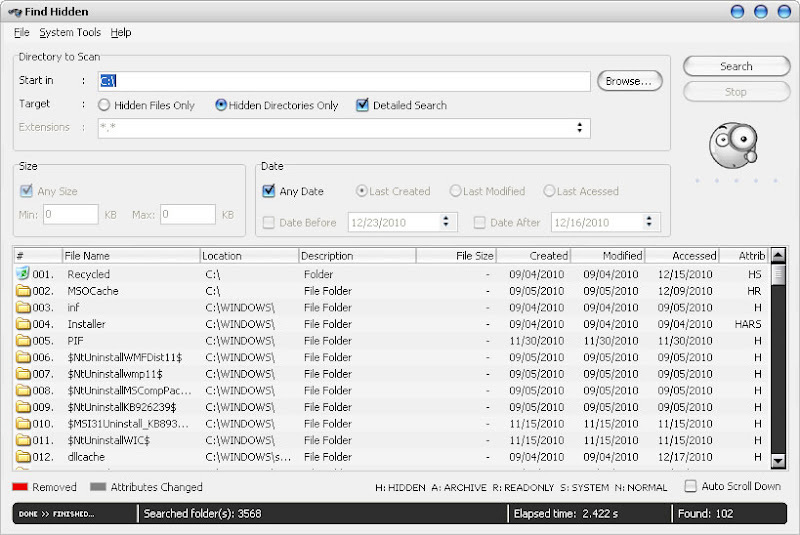 To make searching hidden files and folders easier, FindHidden was created for such purpose. 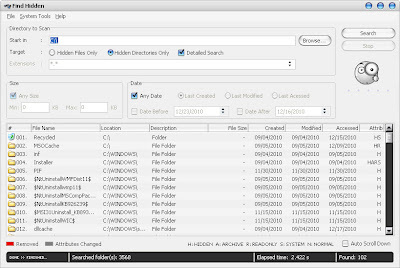 FindHidden gives you the power to search for hidden files in Windows without disabling the invisibility of hidden files and folders. It is a portable application so no need for installation, you can run it right after downloading the file. The usage is simple, just point it to a starting folder or drive which is then crawled by the application. Choose either hidden file or hidden directory. Then specify the file extensions, or specific name and file extension combination of the file or directory you want to search. You can also filter the search result further by specifying file size and date information of the file. A right-click on a specific file on the result list will display the properties menu where you have the options to execute the file, change the file's attributes, open the containing folder in Windows Explorer, delete, copy or unhide, and etc. FindHidden works on Windows OS. I tested it on Windows 7 x86 version.